Welcome to the next segment of our 2019 #TravelTuesday series: Travels with Grace. 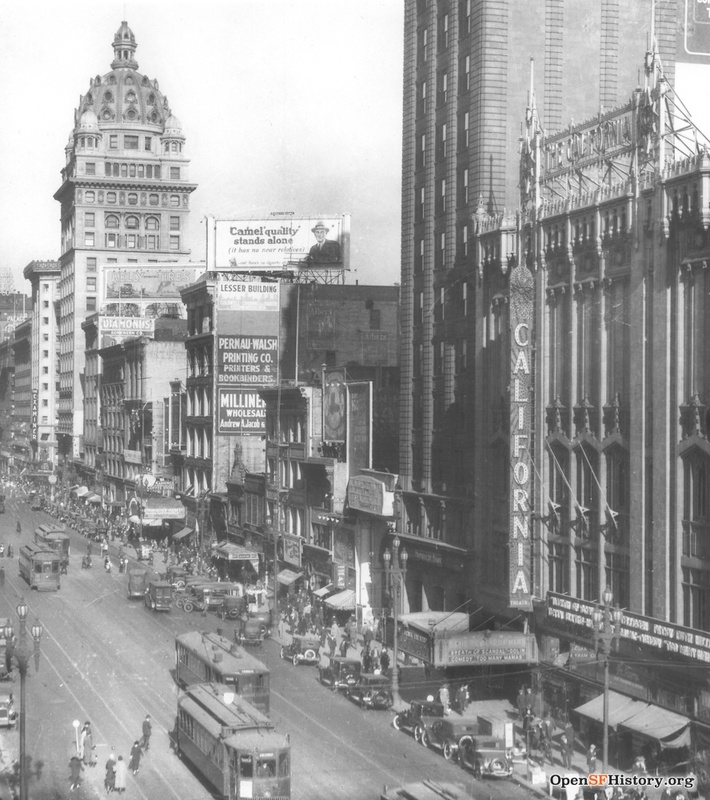 Today Grace begins exploring 1920s San Francisco and its environs. 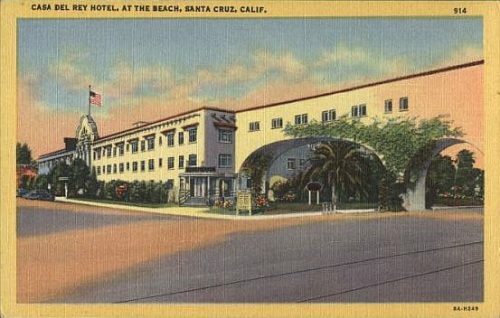 July 6, 1924: Left Los Angeles at 8 A.M. via Southern Pacific. Mrs. Kiwel went [to the] station to see us off. We thoroughly enjoyed our stay here. Our route took us along the coast for many miles, about 150, during which we had the mountains on one side and the Pacific on the other. We went thru the famous Chatsworth tunnel, quite the biggest I have traversed, skirted the Santa Marguerita pass. The trip was one of contrasts, heights and depths, arid wastes, wide stretches of desert lands, on one of which were told was enacted a part of the “Ten Commandments,” and huge sand dunes, then again numerous fields of flowers highly cultivated, or growing wild by the wayside. We also saw huge rocks jutting out into the ocean; on the summit of one such mound of stone and right at the edge was perched a light house. Passed acres of thick green alfalfa. As the scenery grows more rugged, we leave the orange belt behind and pink trees are more in evidence (in the south these are sort of a rarity.) On the train with us was the “Romance” company. Doris [???] sat opposite me in the diner and we talked to some of the party in our car. July 7, 1924: The Hotel Del Monte, where we arrived last night at about 8:15 P.M. is a huge rambling structure set in the midst of a magnificent park of several hundred acres. This afternoon we took the famous 17-mile drive which to us was an unending source of delight. First, we inspected the quant old town of Monterey which really has the most antique atmosphere of any of the other towns I have seen that boast of their ancient inceptions. Here we saw the first custom house, home of first U.S. Consul to California, first theatre in Calif. (it now has geraniums growing up between the steps) and home of Robt. L. Stevenson. Robert Louis Stevenson House, courtesy of the Library of Congress. Then we also saw many pretty modern residences though none so pretentious as those we saw farther south. We skirted the rugged rock-bound coast where the waves come flying into the little coves and bays, many years of their savage poundings having cut out natural caves and apertures into the huge rocks. One of the latter is called Bird Rock and it is simply covered with thousands of huge cormorants constantly fluttering over and setting upon it. A little further on is another rock called Seal Rock fairly glistening with the wet backs of these animals sunning themselves upon it. Parts of the beach are covered with a fine white sand shining as tho with myriads of diamonds, it is the silicate. They make glass of this. 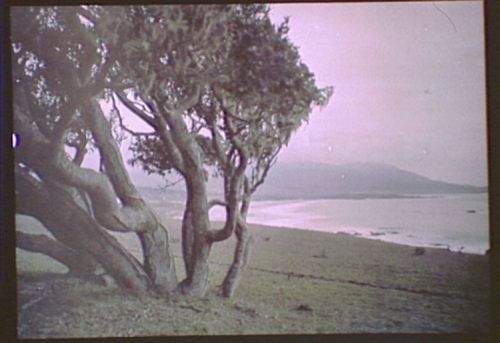 The queer misshapen cypress trees like ghosts, bent by the wind into all sorts of queer shapes, on one side, green and bare on the other. The air is laden with a pungent aroma of pure salty brine. There are many [palms?] with Spanish moss. Carmel Bay, California, c. 1906-1911. Photo by Arnold Genthe, courtesy of the Library of Congress. This scenery has a wild sort of beauty that is fascinating. The waves as they dash savagely up over the rocks send their spray flying dozens of feet high in the air and the coast winds in and out forming hundreds of bays and peninsulas. One lovely place is called Carmel Bay and there is Pebble Beach which is so named for the little black pebbles washed up on the shore. Here are many aristocratic [???] at Del Monte Lodge commanding a magnificent view of the bay. We saw the hotel grounds on our return from the ride. They comprise hundreds of acres; contain vegetable gardens, hot houses, a Roman Plunge, tennis courts, fancy cedar hedges forming a maze, big artificial lake, etc. Watched dancing in hotel tonight. 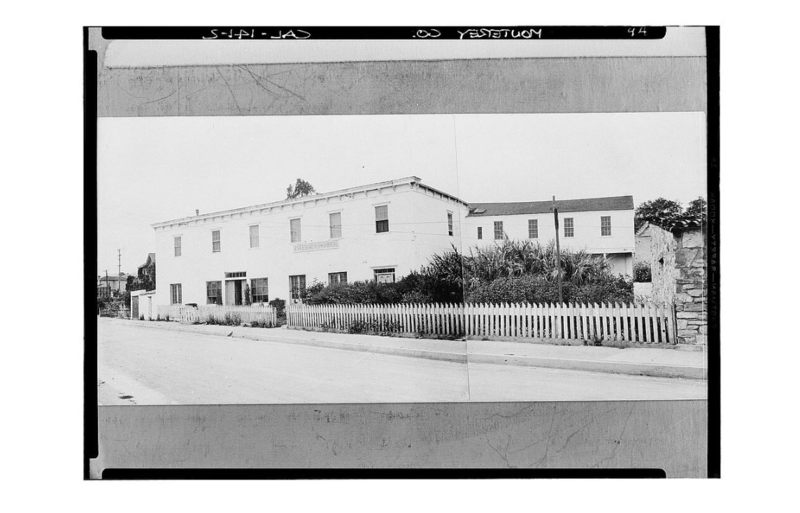 July 8, 1924: Left Del Monte this morning at 8:20. Met a Mr. and Mrs. Cahn on the train, very nice people. The ride was not as pretty as coming up from Los Angeles. Passed a good many fruit orchards and flowers. Principal towns en route San Jose and San Mateo and Palo Alto. Arrived at San Francisco at 12:00 and went directly to Hotel Whitcomb. City is all decorated in honor of visit of British fleet, American and English flags being everywhere in the streets. Not nearly as bustling and crowded as Los Angeles. Sat in hotel lobby tonight and listened to music. Japanese Tea Garden in Golden Gate Park, c. 1920s. 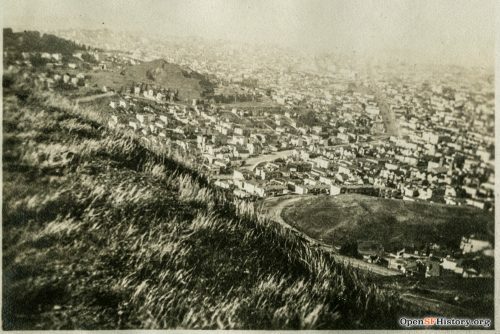 Courtesy of OpenSFHistory. July 9, 1924: The temperature is much cooler here than in Los An. Nearly everyone wears a winter coat. 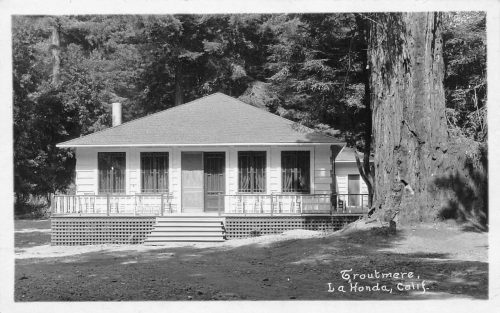 This afternoon we took a thirty mile drive going thru Lincoln Park where is a beautiful public golf course, and terminus of Lincoln highway where we saw old and modern fortifications, soldiers and officers quarters, [prisons? ], huge disappearing guns, etc., Exposition grounds, beautiful Golden Gate park with its many varieties of trees and flowers, chain of lakes on which are wild ducks, black swans, etc., buffalo deer and sheep enclosures, Japanese tea house, Music stand donated by Spreckels. Passed the sulfur baths. View from Twin Peaks, c. 1920. 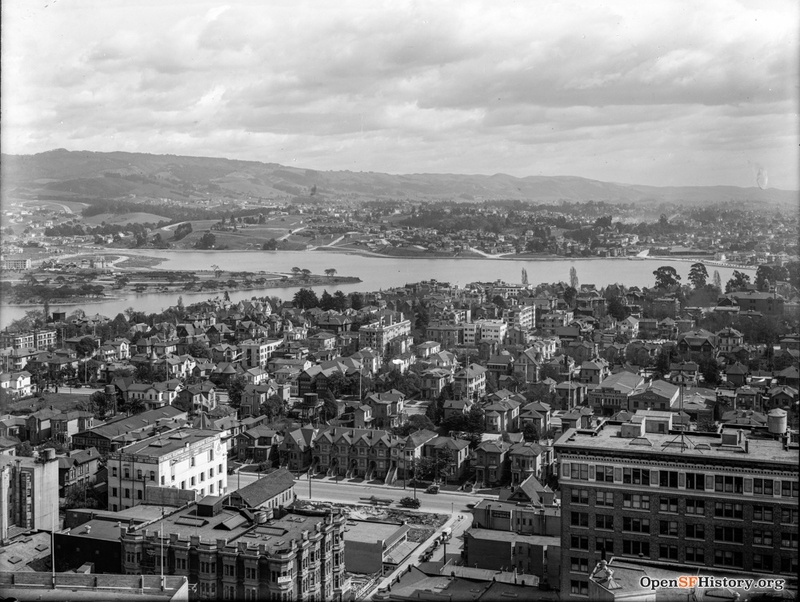 Courtesy of OpenSFHistory. Drove up to the summit of Twin Peaks where we had a good view of the whole city and the Golden Gate, 45 miles long and one of the finest harbors in the world. Went thru the new residential district of Forest Hill, Westwood Park, St. Francis wood, Ingleside Terraces and Pacific Heights where are different types of bungalows all bedecked with flowers, these residences not at all like those we saw in Los An. and surroundings, not as much ground around them and more compact and higher. Nearly all have garages built underneath. Passed Dolores Mission on our return. Went to the St. Francis Hotel for dinner. Mat Crespin, Nathan Hecht there, also Miss [Auspach?] and friend. Saw many of the British officers here. A very lively hotel. Music and dancing during dinner. Afterwards took a walk and saw many pretty shops. Market Street from 4th Avenue, October 1924. Courtesy of OpenSFHistory. 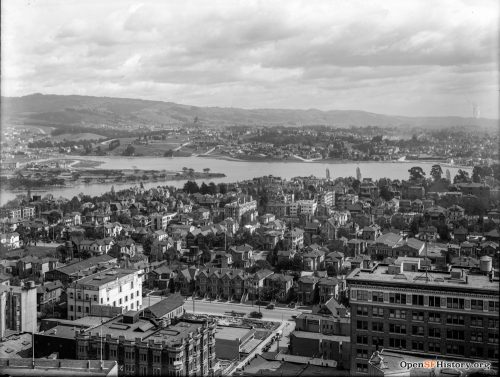 View across Lake Merritt from the tower of Oakland City Hall, c. 1920s. Courtesy of OpenSFHistory. 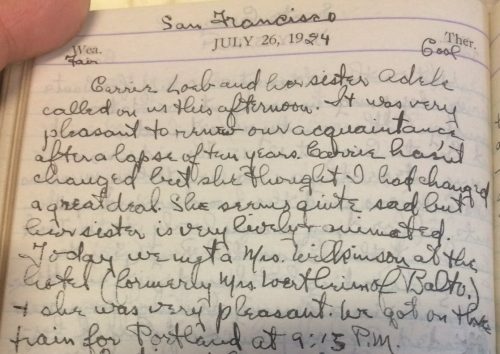 July 11, 1924: We left San Francisco via the S.P. Ferry at 10: A.M. and in half an hour we arrived in Oakland. Passing thru this very pretty city we saw the business district, City Hall, Oakland Hotel, Municipal Auditorium, and Lake Merritt in the heart of the city surrounded by a park and beautiful homes. From Oakland we passed into Piedmont, a millionaire residential district overlooking Golden Gate. Here is house of William Randolph Hearst. We rode around what is known as the Skyline Blvd, where ever-changing panoramas of San Francisco are constantly unfolded as we twist and turn upwards to an elevation of 1400 ft. We stopped at the [Blarraunt?] Hotel for lunch, beautifully situated amidst gardens and commanding a superb view from the balcony of the bay and surrounding country. Then we rode thru Berkley, the whole city was nearly wiped out by fire last year, the campus of the University of California, saw the Campanile 302 ft. of white granite, the Greek theater and the stadium seating 75000. At Richmond we saw the Standard Oil works and site of the new Proctor and Gamble factory (there is also a Shredded Wheat plant here). Then we crossed on another ferry to Point San Quentin where we saw the State Penitentiary and some of the prisoners. This place also has a beautiful location. From San Quentin we continue to San Rafael and thru Marin County where we saw some of the prettiest tracts of wooded land, orchards, flower gardens and luxuriant shrubbery, most of it growing uncultivated in wild profusion. 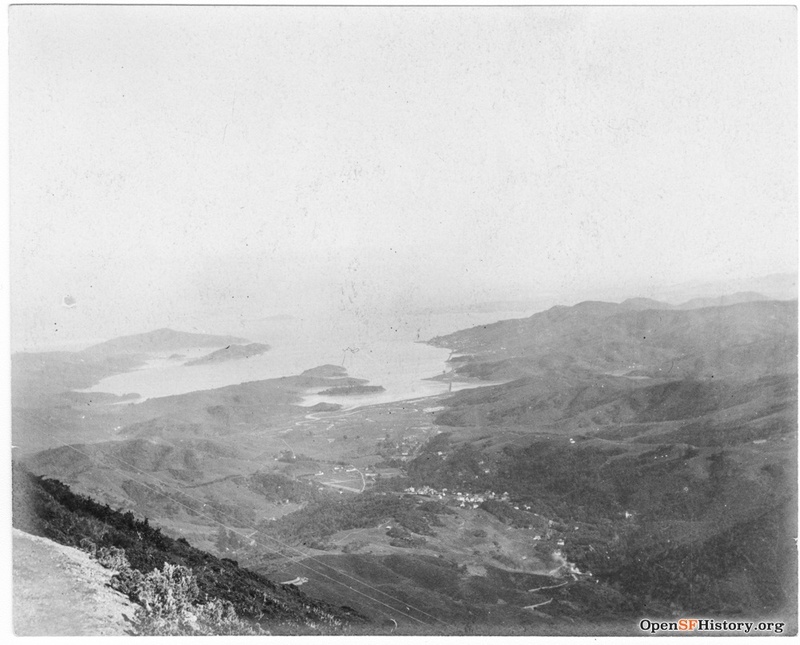 View from Mount Tamalpais, c. 1920, to San Francisco over Mill Valley and Richardson’s Bay. 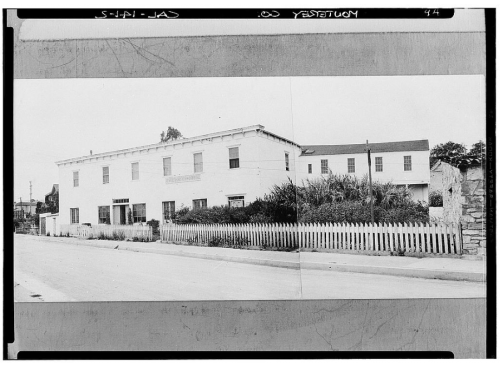 Courtesy of OpenSFHistory. The roads winding under leafy arches. Eucalyptus and redwood trees abound here. Lovely homes border the hills of Ross and Kentfield. Saw Mt. Tamalpais from a distance. Passed thru Mil Valley and Sausalito, little towns resting at the foot of the mountains. At the latter place we boarded the ferry to return to San Francisco and crossed the bay at sunset, having a view en route of the island of Alcatraz where is the Federal Prison. On our return to the hotel we passed thru a part of Chinatown. Upon arriving at our room I found 1 dozen beautiful American beauty roses from Edith Hecht. July 12, 1924: Did not go out today. Mrs. Levy, Jeanette, Gertrude, and Mrs. Werthiam[?] called on us this afternoon. Dancing in hotel tonight. Troutmere, La Honda, California, c. 1920s. Via. July 13, 1924: We left San Francisco in the motor bus at 10: A.M. and rode over winding roads climbing upwards for nearly two hours, passing fields of artichokes, with the buds on some of the plants and on others the big purple flowers. We passed many truck farms, mostly lettuce and giant cabbages, and fields of wheat, alfalfa and other grants, many of the farms cultivated by Japanese, saw herds of blooded stock, mostly Holstein, horses and flocks of sheep. Crystal Spring lakes were strung at intervals along the road and as we climbed up the Coast Range Mt. we caught glimpses of the Pacific and later of Half Moon Bay which gives its name to a little town several miles further on. Then we skirt the sea coast where the road skirts the edge of ragged promontories and looked down upon the jagged reefs extending out into the ocean. From San Gregorio we turn inland, past Troutmere where we see the hatchery of rainbow trout then into the heart of the redwood forest, insects never get into these trees, some of the trees measuring 18 and 20 ft. in girth but the majority much slimmer, many eucalyptus trees, all tall and straight and shedding their bark in little pieces while the madrones shed theirs in long strips which form a soft carpet on the floor of La Honda Canyon (meaning deep canyon). Here are situated many camps and inns, attractive little rustic bungalows, log cabins all bright with flowers and many tents. 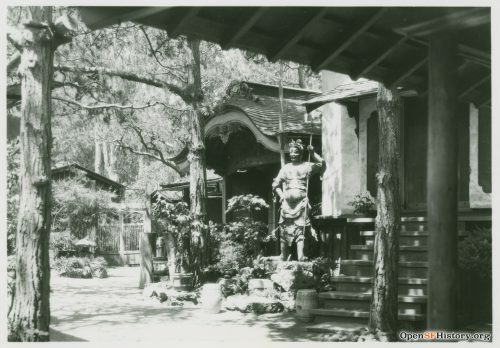 We stopped at Big Tree Inn for lunch, a pavilion fitted out in yellow wood, yellow [???] curtains at windows and little baskets of sweet peas on the tables. Upon leaving here we saw groves of madrone trees with reddish yellow trunks (shedding their bark in little strips) and light green leaves. [Finds?] primroses and yellow poppies beside the road. Visited Leland Stanford University. Handsome yellow sandstone buildings. The memorial chapel incrusted within and within in gorgeous mosaics (biblical subjects) and stained glass windows gleaming like jewels. Mosaic freize or art gallery with appropriate subjects. Saw statue of “Angel of Grief.” Home via bus. [???? And Sam Mat?]. 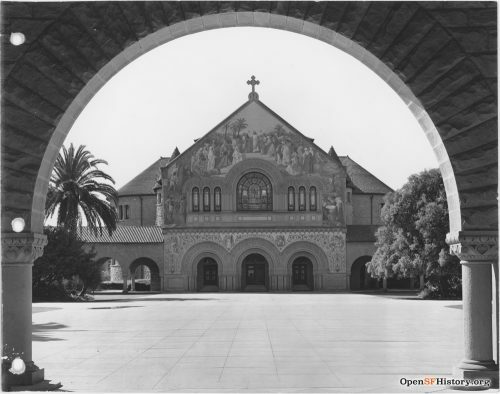 View across Main Quad to Stanford Memorial Church, architect Charles A. Coolidge, c. 1936. 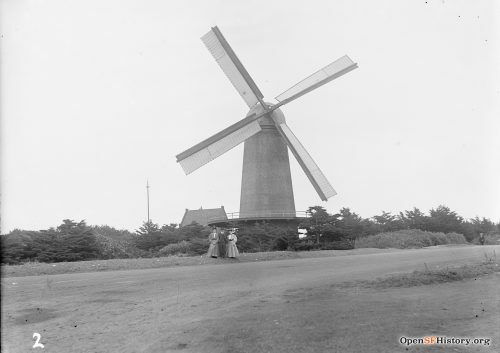 Courtesy of OpenSFHistory. 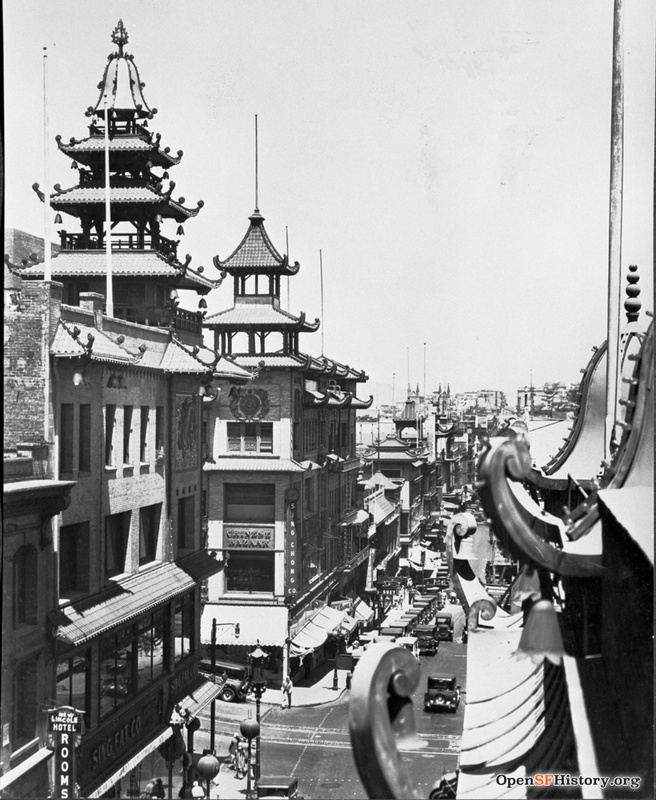 Chinatown rooftop view, north on Grant, c. 1920s. Courtesy of OpenSFHistory. July 14, 1924: Shopped at O’Connor Moffat this morning. Went to the Rosenthal’s home a handsome brownstone house on Pacific Ave and after a visit with them. Mrs. Rosenthal took us in her car to the China Town district where we saw some beautiful oriental shops and then to the Francesca apts. built in the Italian style. Here we spent 2 most delightful hours with Cousin Edith Hecht and her brother Joel in the former’s magnificent apt. We looked at old family photos, some rare books and manuscripts, wonderful antique furniture and art objects. Both she and Cousin Joel are charming, cultured people, highly educated speaking several languages. Their other brother Elias, who is out of town, is a prominent musician of San Francisco. They served up tea. Went to Palace Hotel for dinner. Music and dancing. 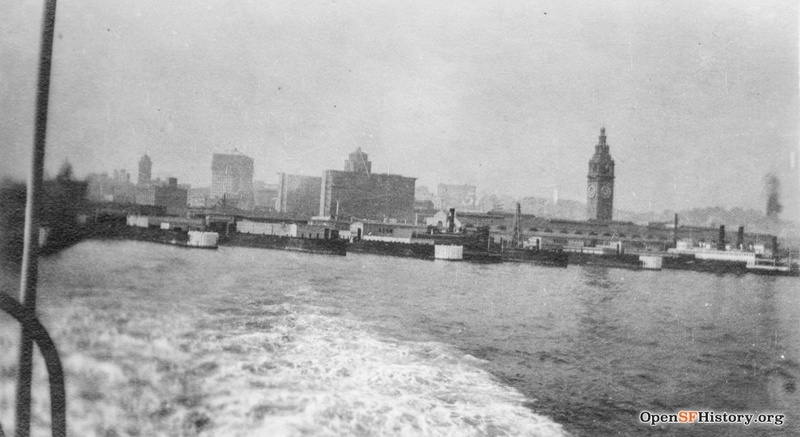 San Francisco Bay, view of the ferry building from a ferryboat, c. 1920s. 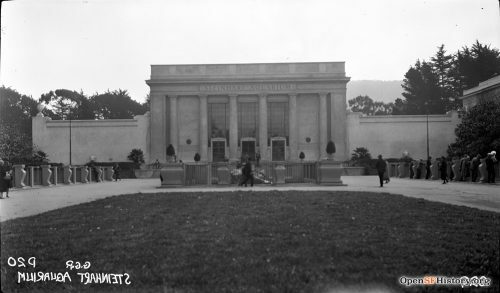 Courtesy of OpenSFHistory. 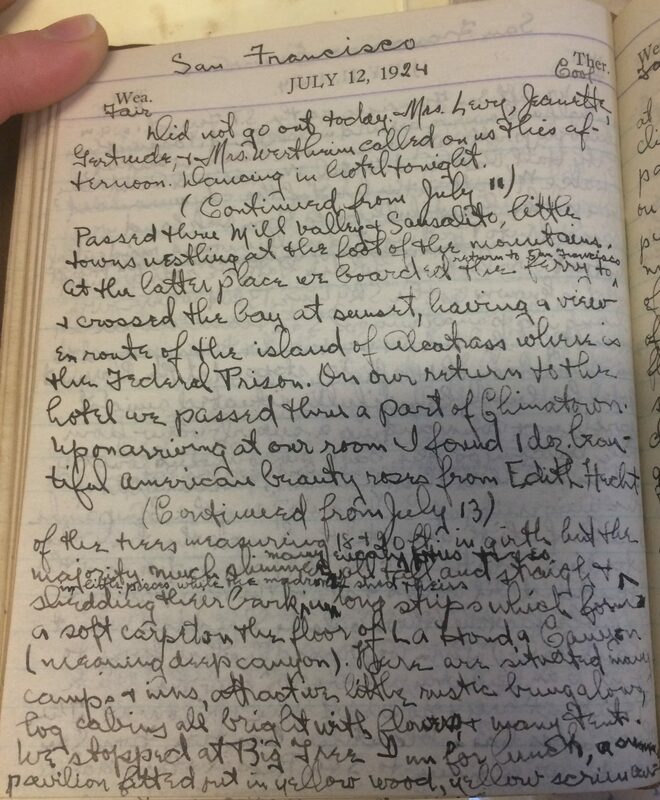 July 15, 1924: Mesdames Rosenthal called on us this morning. The old lady brought us a box of glace fruit and another of lovely cakes. The younger gave us a pretty vanity case. At two o’clock we crossed on the ferry to Oakland and here boarded the train which took us to Merced at 8:50 P.M. The trip was uneventful and the scenery not especially interesting. We again passed the orange groves and palms recalling our trips farther south. At Merced we stopped at El Capitan a very nice hotel for a town of this size (5660). 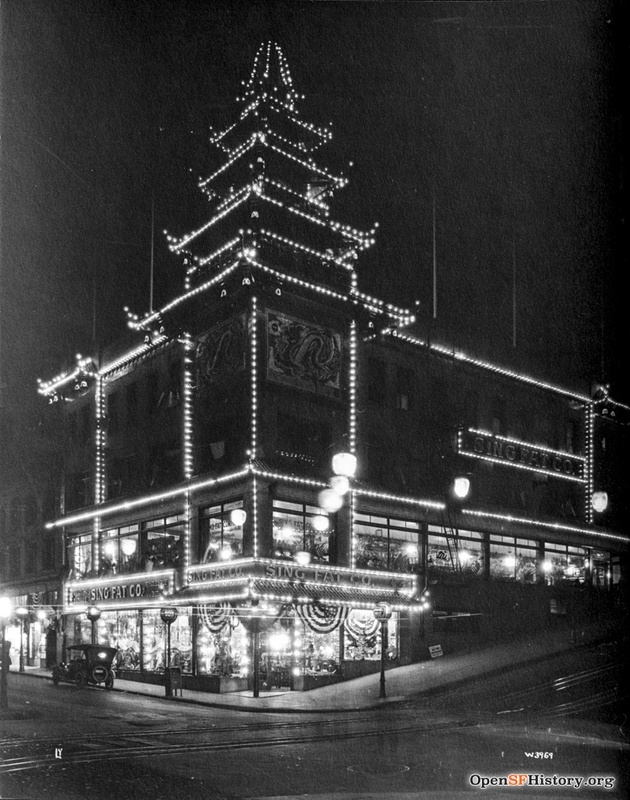 After dinner we took a walk up the street and stepped into the theatre (shows given twice weekly, admission 75 cents but we paid nothing) and saw a vaudeville and movie (Hall Caines’ book “The Master of Man”). It is such a lovely night, moonlight and starlight and soft balmy air like we had in the tropical seas coming out a month ago. We’ll continue with Grace’s California adventures next week as she travels to Yosemite – see you on Tuesday! I was delighted to have the opportunity to take part in this year’s Council of American Jewish Museums (CAJM) conference taking place March 8-10 in San Francisco. 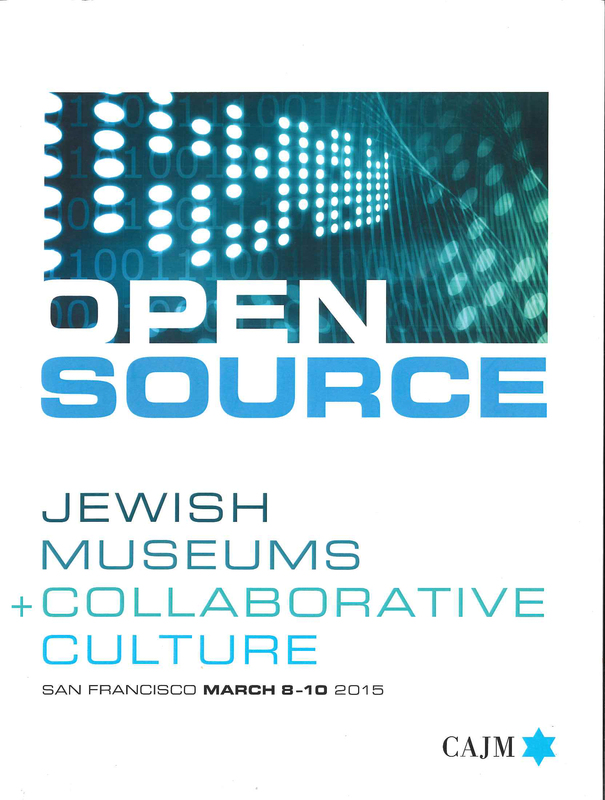 Attended by more than 100 Jewish museum professionals from all over the US, Canada and Europe, this year’s conference theme, Open Source: Jewish Museums and Collaborative Culture was particularly appropriate for its setting in the Bay Area. What a pleasure it was to leave gray, bleak and snowy Baltimore and to emerge from the BART station on Mission Street in San Francisco to a beautiful sunny day. Things only got better from there. 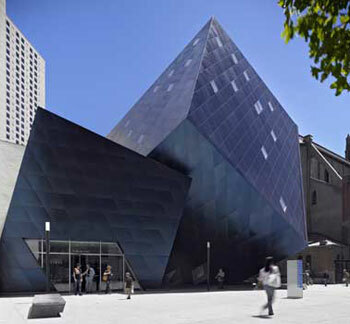 Our first day was spent at The Contemporary Jewish Museum, one of our conference hosts. The CJM provides many wonderful opportunities for community engagement. I was drawn to its warm and welcoming education center featuring an abundance of creative hands-on activity stations that encourage exploration. 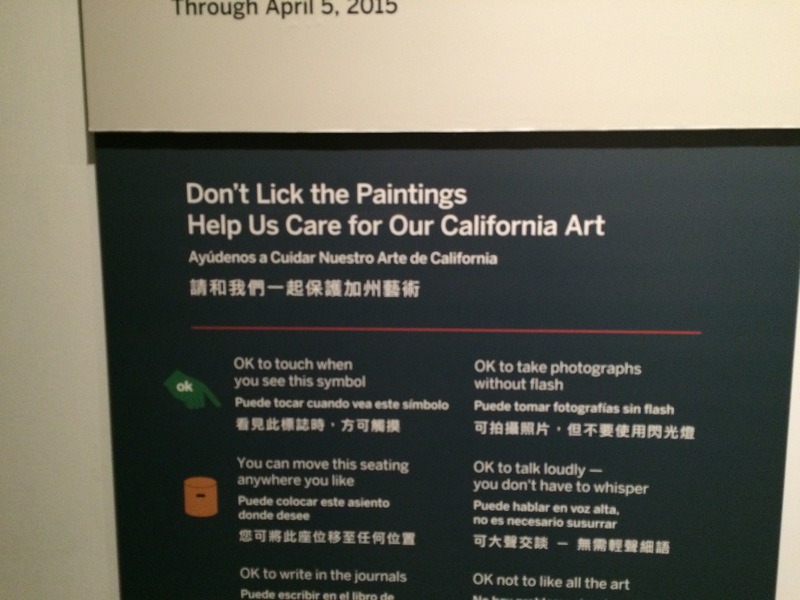 One of my favorite aspects of CAJM conferences is the opportunity to visit other museums and San Francisco did not disappoint. Kudos to conference organizers for casting off the tradition of using buses as the primary mode of transportation and instead relying on public transportation. It was quite a feat that they managed to successfully herd dozens of conferees up and down subway platforms and onto the appropriate trains! 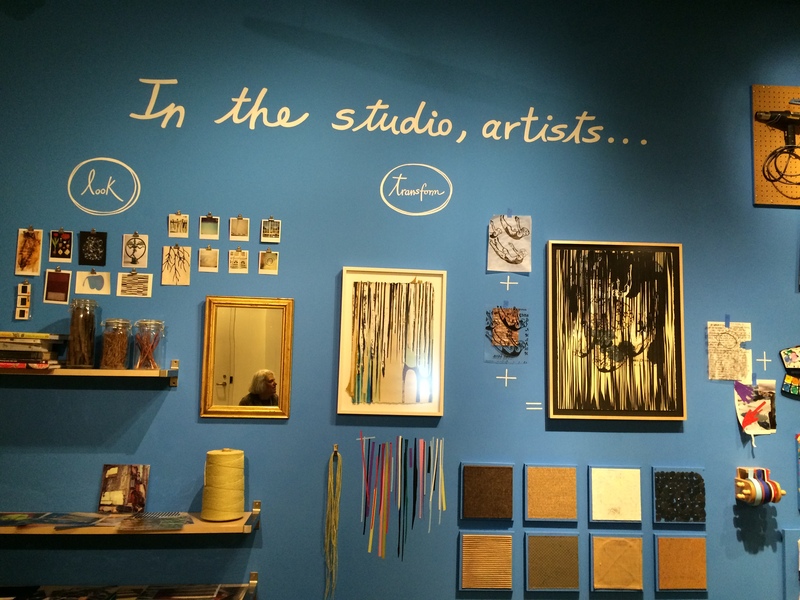 Sites visited included the Magnes Collection of Jewish Art and Life where we had the chance to view Gourmet Ghettos: Modern Food Rituals, the California Historical Society and the Oakland Museum of California. 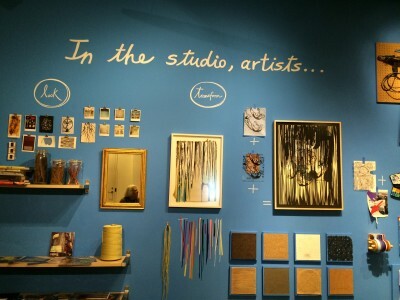 Visiting the recently restored core exhibition galleries of art and history at the Oakland Museum provided inspiration for thinking about the concept of core exhibits as did a related session held that afternoon, “Getting to the Core: Options and Models”. 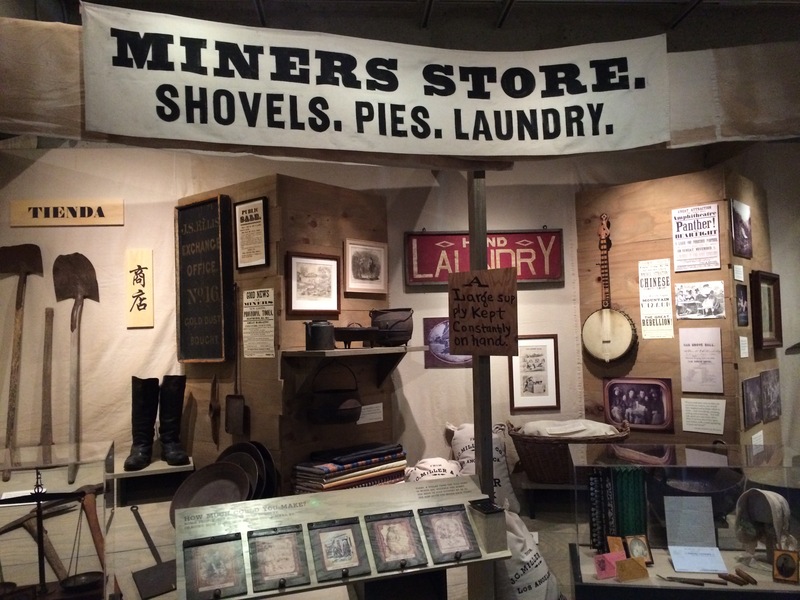 The Museum’s executive director, Lori Fogarty, talked about the history of the project as well as its development process that actively included feedback from a wide range of community members. 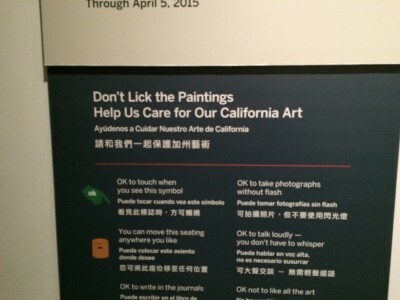 One of my favorite labels ever marked the entrance to the art gallery explaining to visitors the symbols on works of art and asking that they refrain from licking the paintings! By the end of the conference on Tuesday afternoon, I was simultaneously exhausted and energized and looking forward to sharing what I learned with my JMM colleagues. 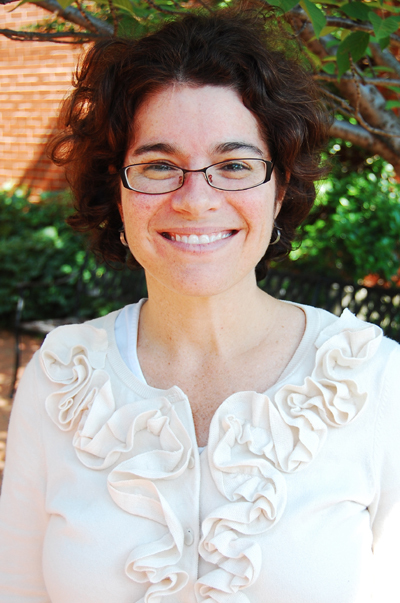 A blog post by Assistant Director Deborah Cardin. To read more posts from Deborah click HERE.